Like lots of you, I think making the choices for flower gardening in containers is the fun part. 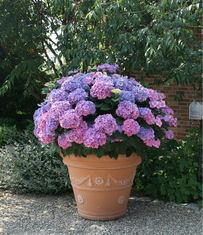 The blooms of flowering plants will generally add the biggest impact of color to our container gardening designs. There are almost unlimited choices when flower gardening in containers! The best thing to me about gardening in containers is that the choice of flowers is almost limitless. I don’t have to limit myself to only plants that will grow in the poor conditions of my neighborhood’s sandy soil. The shade from trees in my backyard doesn’t dictate that I can only grow shade-loving plants. I can select flowers from everything my local garden center or online catalog has to offer – because I control the growing environment – I use the best soil. I control the moisture needed. I can move plants if they need more light or shade. How great is that? 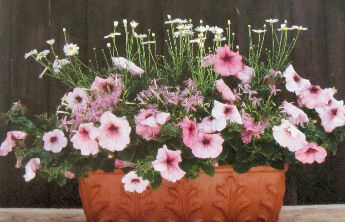 Annuals are the mainstay plants when planning your flower gardening in containers. True annuals have just one season to get started, flower, produce seeds and die. Other flowers that are not hardy are also grown as annuals – impatiens, begonias and geraniums are examples. Annuals have to be replaced every year. They come in dozens of varieties of shape and color, and they can be grown in lots of different conditions. 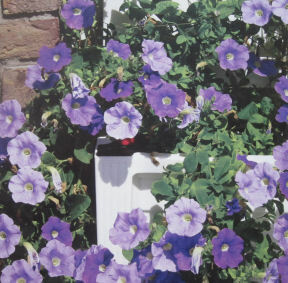 Annuals can be purchased that climb, vine, mound or grow upright. Many annuals prefer sun – petunias and marigolds are a couple – but in the shade, impatiens and begonias do great. There are also annual plants which can add color and texture to your container gardens in their foliage. Coleus and sweet potato vines are two of my favorites. They come in colors from lime green to burgundy to dark purple. I use them in both sun and shade – they are so versatile and pretty tough. If you want color or impact right now, annuals are your choice. If you need to replace a plant because its blooming season is done, or it has wilted or been diseased, an annual can replace that plant right now. Perennials are in it for the long-haul. If properly cared for, they will live and bloom year after year. Over time, they are definitely less expensive for your garden since they don’t have to be replaced every year. Flowers grown as perennials do not generally have a long bloom time, but many of them do. I have coneflowers, daisies, lilies and other blooming perennials that bloom throughout the season if I make sure to deadhead or trim them back as needed. Perennial flowers for container gardens can be planted by themselves, or mixed with annuals for longer color. Perennials come in huge varieties of color, shape, form and texture. Some perennials are valued for their foliage. When flowers fade, foliage in fantastic colors or textures can see your container garden through to the next blooms. My favorite perennial foliage plants are hostas and ferns, but there are tons of others. Check them out – they add beauty and interest to your container designs. Add some permanence and structure to your garden areas with flowering shrubs in containers. I have several that do well in containers and they bloom every year – I have grown spirea, azaleas and roses in containers, as well as hydrangeas (shown here). 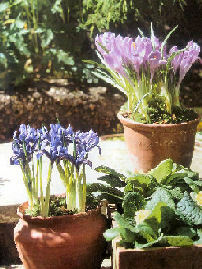 Flower gardening in containers includes plants grown from bulbs – don’t forget them. Flowers and other plants like hostas, that can be started from bulbs do great in container gardens. You can start them indoors for early spring blooms. Grow traditional spring flowers like daffodils, tulips and hyacinths – or try some others – these flowering bulbs can easily be grown in your container gardens. Many vines, trailing plants or climbers are great varieties to use when flower gardening in containers. 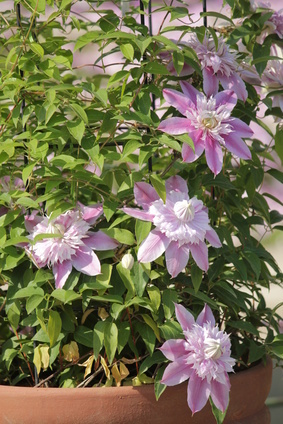 There are both annual and perennials (like clematis shown here) types of blooming vines that work very well in pots. Plant them alone, or grow them up a trellis or support to add structure to your container. Use them as a backdrop for other plants in this way. To the front or sides of your container, plant them to trail or spill over the sides of the box or pot to soften the edges of your garden design. While we don’t think of growing edibles as flower gardening in containers, many herb or vegetable plants do flower at some point and are very attractive planted alone, or in plantings with annuals or perennial flowers. Many herbs and vegetables vine and they can be trained up a trellis or other support too. Use them as a backdrop for your flowering plants. So, make your selections for your potted gardens based on your preference of color, height, bloom time, growing season, etc. The National Gardening Association is a great resource. Go to their plant finder and play around with it. Select colors, types of plants, sun or water requirements, etc. You can even select “good for container gardening” as a parameter. Enter your own growing region(their site will find it for you based on zip code), and you’ll get a personalized list of plants that will work just for you. For personalized ideas about your own flower gardening in containers, check them out.